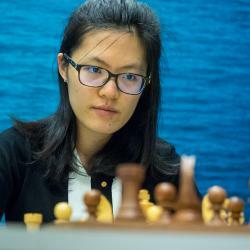 The newest challenger to Judit Polgar’s long held reign as the top woman in chess, Hou Yifan has become a star in a short amount of time. Despite only being 20 years old right now, she has accomplished more in her lifetime than many other players before her accomplish in their entire careers. She became the world’s youngest woman Grandmaster, youngest woman World Champion and has achieved a rating approaching Judit Polgar’s level. She has many more years ahead of her and will surely have a great shot at breaking many more records. Hou Yifan learned to play chess when she was 3 years old and showed a strong aptitude for the game at a young age. She got her first chess coach, an International Master, when she was 5 years old and began to regularly play in tournaments when she was 6. Her coach described her as being an “unusual talent” who had “strong confidence, distinguished memory, calculating ability and fast reaction”, despite being so young. When she was 10 she was allowed to learn at the National Chess Center in China. There she had Chinese Grandmasters as her trainers which helped to speed up her progress. She became a Woman Grandmaster in 2007 then an official Grandmaster in 2009 at the age of 14. Soon after becoming a Grandmaster, she won the Women’s World Championship in 2010 when she was 16 which made her the youngest Women’s World Champion ever. She achieved her best rating of 2639 near the beginning of 2012, a rating which is the second highest by a woman in history behind Judit Polgar. Yifan is still very young and has a very bright future ahead of her, working on holding on to her Women World Championship title as well as chasing Judit Polgar’s record.